Poughkeepsie First planned neighborhood in city; many Victorian-era homes. Poughkeepsie 1835 Greek Revival home which belonged to local artist, Thomas Barrett. Now a local arts center bearing his name. Poughkeepsie Now Bardavon Theatre. Built in 1869 and still a popular venue for bands, movies, and comedians. Poughkeepsie Built about 1910 and is a 1 1⁄2-story, three-bay-wide frame Bungalow–style dwelling. Poughkeepsie Mid-19th century neighborhood homes for those who became wealthy from early industrialization. Renamed in memory of James A. Garfield after his assassination. Poughkeepsie Built in 1869, is an historic Second Empire style building. Poughkeepsie Built in 1911 and is a 1 1⁄2-story, two-bay-wide concrete block Bungalow-style dwelling. Poughkeepsie Early department store was at one point the only one in Hudson Valley between Yonkers and Albany; major draw to city's downtown. Poughkeepsie Group of three houses across from Adriance Library and Hasbrouck House includes oldest frame house in city. Poughkeepsie 1909 Late Gothic Revival firehouse by local architect Percival M. Lloyd. Only one of the city's six engine company firehouses remaining. Poughkeepsie Former city hall constructed in 1831 in the Greek Revival Style. Now used as the Commissioner of Jurors Office. Poughkeepsie Historic Quaker (Society of Friends) meeting house built in 1927. Poughkeepsie Beaux Arts building completed in 1906 was Hudson Valley's first skyscraper and had the city's first elevator. Today used as Dutchess County District Attorney's offices. Poughkeepsie Built about 1910 and is a 1½-story, three-bay-wide, bungalow-style dwelling. Poughkeepsie Dedicated in 1937 by President Franklin D. Roosevelt, a Hyde Park native who insisted on preserving the Dutch heritage of the area through the use of fieldstone and was heavily involved in the design process. Poughkeepsie Senior-citizens' home built in 1880 served that purpose for almost a century. Now used by Cunneen-Hackett Arts Center and offices of local non-profit organizations. 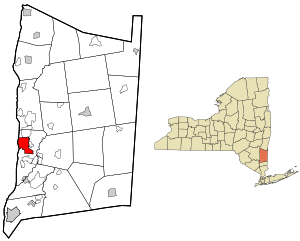 Poughkeepsie Known as "Springside". Landscape by Andrew Jackson Downing is his only known surviving work largely as he designed it. Poughkeepsie 1908 building is only glazed terra cotta building in city (only the facade remains). National Register of Historic Places listings in Poughkeepsie, New York Facts for Kids. Kiddle Encyclopedia.